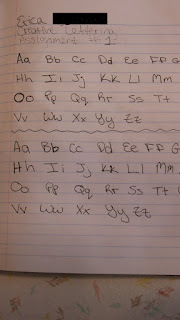 I am taking a lettering class with Nicolette Anderson (http://nickieblog.blogspot.com/). I love it and highly recommend it, especially for people like me who stink with making pretty lettering. 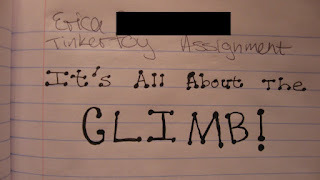 So far I have done three assignments: writing out an alphabet, writing a quote ("It's all about the climb") in an alphabet called Tinkertoy, and writing the same quote in a different alphabet and then using color in the negative space. Here's my "homework"! I made this piece after reading about the technique in Violette's "Journal Bliss." I put two layers of gesso on a page in my composition book. 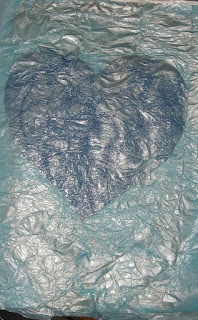 Then, I glued on a blue heart made of construction paper. Next, I glued on a layer of light blue tissue paper and used some pearly white paint. Lastly, I applied gel medium. I was originally supposed to pay 48 dollars, but, with the coupons, I got it all for 32 dollars! What a bargain! Now, I should be set for a while! This year, I asked my best friend, Ao, to be my Valentine. I am bribing her with a collage I made! haha. I used three sheets of patterned paper as the background. 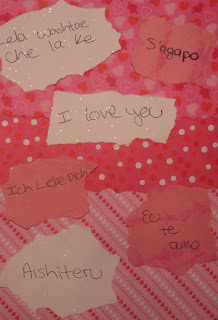 Then, I wrote "I love you" in six different laguages using a ballpoint ink pen (I have not yet received my fountain pens from www.dickblick.com). I used a glue stick to attach them. I really hope my "Aoica" likes it! I made this very simpe piece with markers on plain computer paper that already had "Erika" printed on it. Erika is my "adopted" soldier through Soldier's Angels (www.soldiersangels.com). I am going to mail it to her tomorrow, along with a letter I wrote her. I cannot sleep again tonight, which is a bummer. Oh, well... I will make the best of it by making things and such. Just a note: the bottom of the paper got cut off by the camera. I made my new art journal's introduction page. Yesterday, I put white gesso on the page with the intention of making a collage today. 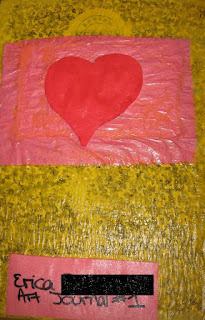 But then, I used three different sheets of tissue paper and attached them to the page with a glue stick. Lastly, I used a quote I printed out. 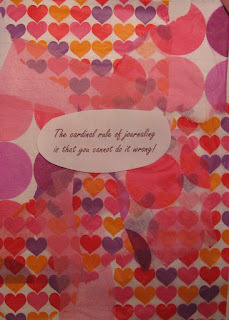 It reads, "The cardinal rule of journaling is that you cannot do it wrong!" The quote is courtesy of Tera Leigh (www.teras-wish.com). Today I woke up at 1pm, since I had to catch up on sleep. After I woke up, I at some breakfast, checked my email, and then started to create. 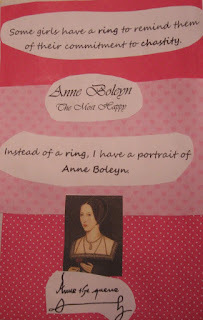 I ended up making a tribute to Anne Boleyn (the second wife of Henry the 8th of England) in the composition book I am using for art journaling. I am a huge fan of the Tudors, so I greatly enjoyed making this piece!